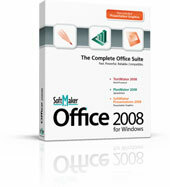 Get SoftMaker Office 2008, alternative to MS Office for free | aeBeta : IT Resources and Reviews , Software Tips and Promotions ! OK, the promoting idea may come with the holiday, but you may notice that there is newer version coming out – SoftMaker Office 2010. So why not give away the version 2008 for free? To get the license is quite simple, what you need is just to fill a form and check your Email. About this Office Toolkits, I have little to say. After all, I haven’t installed this software yet. But from the reviewing from my friends, I really think it worthy having a try.